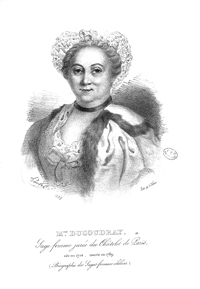 Parisian midwife Angélique du Coudray worked in the court of Louis XV. In 1759, the king launched a project to decrease infant mortality rates and commissioned her to teach midwifery to peasant women. From 1760 to 1783, she traveled all over France, visiting poor rural women and sharing her extensive knowledge with them. It is estimated that she trained some 10,000 women. Du Coudray also invented the first lifesize obstetrical mannequin, for practicing mock births, and published a well-received midwifery textbook, Abrégé de l’art des accouchements (The Art of Obstetrics, 1759).